Nosebleeds occur usually after an impact to the nose and may be associated with a fracture. However, they can occur after relatively minor injuries or be completely spontaneous. Facial fractures are breaks in any of the bones which form the face. These are the mandible or lower jaw, maxilla consisting of upper jaw and nose and the zygomatic bones or cheeks. Temporomandibular joint disorder or dysfunction is a problem with the joint between the jaw bone or mandible and the skull. These joints are located just in front of the ears. Bleeding may occur from either one or both nostrils. Blood flow can range from very light to heavy and may last for a few seconds to 10 minutes or more. Blood in the throat may cause nausea. A nosebleed is usually caused by an impact to the nose which ruptures one or more small blood vessels in the nose. Moderate to hard impacts should be investigated for a fracture and to ensure that the airways are not affected. Blowing the nose very hard or picking the nose can cause damage to the delicate blood vessels of the walls of the nose, resulting in minor bleeds. Nosebleeds can occur spontaneously, without any trauma to the face. Colds and flu, sinusitis, hayfever, high altitudes, and snorting recreational drugs can be a factor. Treatment: Pinch the nose just below the bony part of the nose. Sit down, leaning forwards so the blood doesn’t run down the throat. Breathe through the mouth! Keep pinching the nose for up to 20 minutes, checking for bleeding every 5 minutes. If bleeding is very heavy or doesn’t stop after 20 minutes, seek medical attention immediately. Following a nosebleed, try to leave the nose alone, don’t blow it hard and don’t move the head quickly for up to 12 hours after the bleed stops. If they occur regularly with no trauma to the nose, visit your doctor. Facial fractures are breaks in any of the bones which form the face. These are the mandible or lower jaw, maxilla consisting of upper jaw and nose and the zygomatic bones or cheeks. Symptoms vary depending on location and severity, but generally include instant pain, swelling and bruising usually appears. Cuts may be present, especially when the injury was caused by a sharper item. One side of the face may appear deformed compared to the other side. There may be bleeding from the nose or eyes and a straw-colored or pale fluid from the eyes, ears or nose. Facial fractures occur as a result of a direct impact. This may happen in sports such as rugby where a knee or elbow may impact on the face, hockey or cricket where a hard ball may hit the face, or as a result of a road traffic accident. 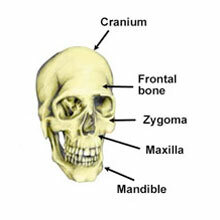 The zygomatic bones form the cheekbones and the lower part of the eye socket. This fracture most often occurs after a fist or a ball has hit the cheekbone. Complications usually involve the eye, such as a sunken eye, altered vision or reduced sensation around the eye. Treatment may be surgical to reduce displaced bones and surgically fix unstable fractures. A maxillary fracture is a break in the upper jaw bone, which includes the nose. These fractures may be accompanied by obstruction of the airways, swelling of the soft palate and disturbances of the eye socket. Initial treatment should be aimed at protecting the airways which are best achieved by sitting the patient leaning forwards. Medical attention should be sought immediately for x-ray diagnosis and any other necessary investigations. Appropriate treatment may involve surgery, using wires, screws or a plate to fix the bones. Mandibular fractures occur at the lower jaw bone and are the most common form of facial/skull fracture. This injury usually results from a direct blow, such as a punch to the face or being hit with a hardball. Fractures often occur in more than one place and may be displaced or undisplaced. Undisplaced fractures are generally minor injuries causing pain and swelling. They do not require any treatment other than rest and pain control. It may be necessary for the patient to eat only soft foods for 2-4 weeks to allow the jaw to rest. Displaced mandibular fractures are more serious injuries which often involve the teeth (alveolar fractures). These can be identified when two or more teeth move together as a unit, separate from the others. They may appear malaligned and the floor of the mouth bruised. Immediate treatment should involve maintenance of the airways in a forward sitting position. The jaw should be supported by the patient’s hand, or by another individual or a bandage or cervical collar. Most displaced mandible fractures need surgical reduction and fixation to regain to normal position and to allow the bone to heal. This may take 4-6 weeks. In this time, soft food only is permitted and a dietitian should be enlisted for advice to ensure a healthy diet is maintained. Temporomandibular joint disorder is a problem involving the joint between jaw bone (mandible) and the skull, located just in front of the ears. Symptoms include pain around the joint which may radiate into the neck or jaw muscles. Their jaw may lock or have a clicking or clunking feeling. The patient will be unable to open the mouth wide. Symptoms include pain around the joint which may radiate into the neck or jaw muscles. Their jaw may lock or have a clicking or clunking feeling. The patient will be unable to open the mouth wide. The jaw will be stiff and the teeth may not fit together exactly as they did before the injury. Temporomandibular joint disorders can occur due to direct impacts to the joint which affect the alignment of the joint. The jaw may even dislocate and then pop back in! The joint can be overstretched when yawning widely or opening up for the dentist! The joint can become degenerated and develop arthritis. This is mostly seen in older people. Muscle tension in the muscles which attach to the jaw can pull the joint out of alignment. The muscles may be tight because of teeth clenching, jaw grinding, biting nails and holding things between the teeth. If you think you have a problem with your TMJ, visit your Doctor or Dentist. They will examine it and determine what the problem is. In minor cases, self-treatment is usually effective. This may involve rest, anti-inflammatory medications (if prescribed) and exercises prescribed by your Doctor or Dentist. If your TMJ disorder is due to clenching or biting at night, your Dentist may give you a bite splint to wear at night. Surgery is very occasionally used to help realign the joint.